In our last session, the party fought off some ghouls and and evil priest, coming back with a large sum of gold in the form of jewels. They rested in Frostmark for a few days, then returned to the dungeon beneath Giant Fall. This time they were able to explore the north section, where they found a secret room, inside which was the body of the old Abbot. They recovered a key from his body, and continued on. The key, they found, fit a door in the room where they had just defeated the evil priest. Ambrose unlocked it, and saw a dark, circular staircase down. They went down the stairs, perhaps 40 feet, and walked into a small cavern. There were several exits – from the north, they heard rushing water. To the south and west, all was quiet. They discussed where to go and decided that south probably was the source of the ghouls they had seen on the upper level. South they went, through a narrow tunnel that ended in a rough set of stairs down into a large, circular cave. The cave did indeed have ghouls in it – seven of them, who rushed the party as they came down the stairs. The narrow tunnel served as a bottleneck, and only two of the ghouls could attack the front line of the party, that being Ambrose and Roger. Unfortunately for them, the first two ghouls to attack got lucky and hit both, paralyzing them. Imric read his protection from undead scroll, while Zort and Rolgrim helped pull Ambrose and Roger out of harm’s way. Now with a bit of time to think, the party hatched plan. They spread oil on the stairs, then Imric dismissed the protection magic. They lit the oil as the ghouls advanced, and peppered them with arrows and holy water from higher ground. Soon all seven were killed, Ambrose and Roger were healed, and the party advanced into the cavern. The circular cavern was perhaps 60 feet wide and had a high ceiling – they party could see the roof almost 30 feet overhead, just at the limit of their lantern light. Inside they saw 12 crypts lining the walls, all but one with a stone sarcophagus inside it. Rolgrim and Roger set about opening each sarcophagus in turn, while Thom illuminated just about the entire cavern from the center. They found an exploding skeleton – which luckily did not injure Rolgrim or Thom too much, some loose gold coins, and a potion bottle. One crypt was empty, save for a circle on the floor. The circle was red and inlaid with gems and runes about its circumference. Imric was able to decipher the runes, noting that it was a summoning circle for a “Servant of Nezzir”, known to Zort as a god of chaos. He also saw it as radiating magic. At this the party backed away, all but Roger, who could not contain his greed. He reached down and pried a gem from the circle with a crowbar. As he picked it up, the cave was plunged into darkness – just for a moment. 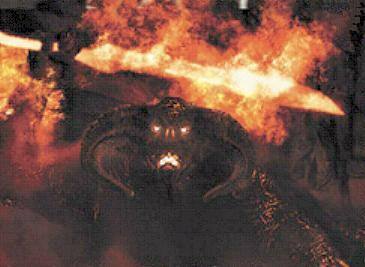 Now illuminating the cavern, from its center, was a Balrog! The party watched as poor Thom was immolated by the demon, standing as he was in the center of the cavern. Flee! Run away! The party ran for the lone exit. As they did so, the Balrog’s whip flew out and caught Rolgrim, dragging him in to certain death. Imric took a moment to activate his necklace (DM Note: The necklace acts as a protection from evil, 10′ radius spell, 3x per day), and he and the rest of the party narrowly escaped up the stairs. They fled at top speed out of the dungeon and back to Frostmark, intent on seeking the counsel of the Wizard Adrazzias, as soon as possible. rings, although it will continue to keep out enchanted monsters.) Duration: 6 turns. I certainly viewed the Balrog as ‘enchanted’, but then the part about keeping out attacks yet also evil attacks getting -1 to hit dice (attack rolls) is confusing – does the spell allow weapon attacks from enchanted creatures, or not? With the benefit of future clarifications to this spell, we know it does (most notably in Moldvay B/X. Holmes Basic clarifies the types of creatures that are enchanted, but still has the confusing bit about evil attacks, almost verbatim). But here I chose to assume it gave absolute protection from enchanted creatures, with the weaker protections given for attacks from standard, non-magical chaotic creatures, like Orcs or Ogres. It seemed more in line with the literary roots of OD&D – the lone wizard summons a demon, and is protected from all attacks as long as his spell is active. Or I might just be getting soft in my old age.